Abby the Librarian: AudioSynced: January Roundup! It's time for your monthly AudioSynced Roundup! If you're looking for your next great listen, look no further! Check out these posts and reviews of audiobooks from around the blogosphere in January. If I've missed your review, please leave me a link in comments and I'll add it to the roundup. Didn't get to an audiobook this month? Don't worry; Kelly will be hosting AudioSynced at STACKED again next month! Well, the biggest news of them all: the American Library Association's Youth Media Awards have been announced! 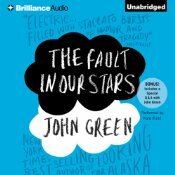 The winner of the Odyssey Award for excellence in youth audiobooks is The Fault in Our Stars by John Green, read by Kate Rudd, produced by Brilliance Audio. 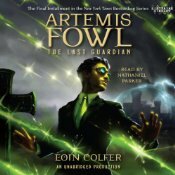 Artemis Fowl: The Last Guardian by Eoin Colfer, read by Nathaniel Parker, produced by Listening Library. 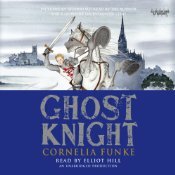 Ghost Knight by Cornelia Funke, read by Elliot Hill, produced by Listening Library. 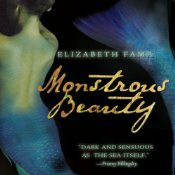 Monstrous Beauty by Elizabeth Farma, read by Katherine Kellgren, produced by Macmillan Audio. Think you don't have time for audiobooks? Janssen of Everyday Reading is writing for Goodlife Books on how to squeeze audiobook listening into your busy schedule. She also recommends five of her favorite audiobooks to get you started. Hard Gold by Avi, read by Alston Brown, reviewed by Lisa at Shelf-employed. Lisa says, "The diary style is well-suited for audio format." The Spindlers by Lauren Oliver, read by Simon Vance, reviewed by Jen of A Book and a Latte. Jen says, "Fans of Jim Dale (narrator for the Harry Potter series) will really enjoy his [Simon Vance's] voice and style." Crash by Lisa McMann, read by Allyson Ryan, reviewed by Sarah of YA Love. Sarah says, "I chose to read Crash with my ears because reading it traditionally wasn’t holding my attention. I write this first because the audio swayed parts of my enjoyment of this book, but not all of it." The Diviners by Libba Bray, read by January LaVoy, reviewed by Beth of A Foodie Bibliophile in Wanderlust. Beth says, "I can't imagine anyone being a more perfect narrator for the audiobook of The Diviners than January LaVoy." The Freedom Maze by Delia Sherman, read by Robin Miles, reviewed by Kimberly of STACKED. Kim says, "The narrator has a perfectly authentic Southern drawl and gives the white and the black characters accents without exaggeration." The Freedom Maze was also reviewed by Lee at Reading with my ears. Lee says, "Miles is excellent here, managing a large cast of characters from two centuries and races." Seraphina by Rachel Hartman, read by Mandy Williams and Justine Eyre, reviewed by Lee of Reading with my ears. Lee says, "Mandy Williams... portrays Seraphina with a voice that reflects her prim, analytical nature with that of a girl who is just beginning to spread her wings." The Silence of Murder by Dandi Daley Mackall, read by Emily Rankin, reviewed by Kimberly of STACKED. Kimberly calls it, "a leisurely-paced story that is narrated well." Destiny of the Republic: A Tale of Madness, Medicine, and Murder of a President by Candace Miller, read by Paul Michael, reviewed by Carin of Caroline Bookbinder. Carin says, "His [Paul Michael's] deep, sonorous voice was perfect for a presidential bio: very authoritative and respectful." The Last Werewolf by Glen Duncan, read by Robin Sachs, reviewed by Lee of Reading with my ears. Lee says, "Robin Sachs... takes command of Jake’s story from the get-go and never lets up."